State-level base maps of proposed Section 368 energy corridors and supporting information, in Adobe Acrobat format. 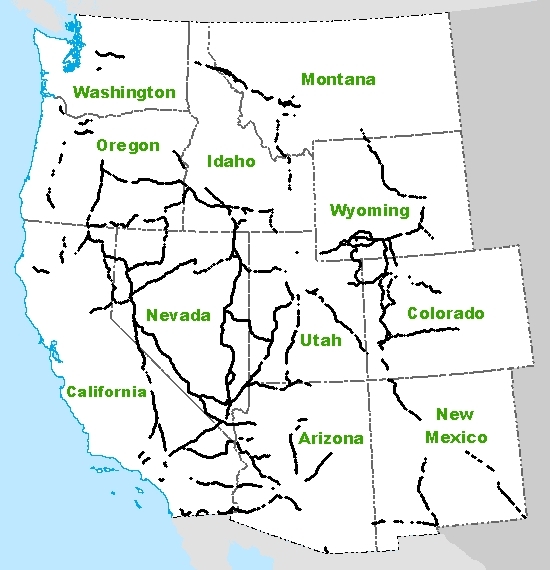 Follow the links below to view/download state base maps that show the locations of proposed energy corridors in each of the 11 western states. These maps also show federal land ownership, state and Tribal lands, major topographic features, cities and towns, and major roads and highways. Select maps by clicking on the text links or the hyperlinked ("hot") index map below. The following documents are in PDF format, which requires the free Adobe Acrobat Reader. Note: Most users will already have Acrobat Reader software installed on their computers.